Local is not necessarily the best way to lighten your carbon footprint. Instead, we should do two things. One, grow food where it grows best naturally (where the water and soil and temperature are right) and ship it by truck or train (not air) to other places rather than dipping into underground aquifers to grow food in the desert. Two, eat no meat or at least less of it. He said individual Americans eat 260 pounds of meat each year; that should be cut to none or to 12 pounds per year (one pound per month). This, more than anything, lightens your carbon footprint. Organic is not necessarily better. He said genetically modified food has been studied for 12 years, and so far there is no decisive evidence that organic foods are higher in nutrition or that GMOs are dangerous to our health. However, he did say that we should not be growing monoculture GMO soy and corn and cotton that goes to feed animals and into processed food. Instead, we should be growing “orphan crops” like sorghum, sweet potato, and millet. McWilliams was not against industrial agriculture for plants; he said he has no problem with factory farmed carrots, but subsidies need to change. He showed the two pyramids I’m sure you’ve all seen by now. 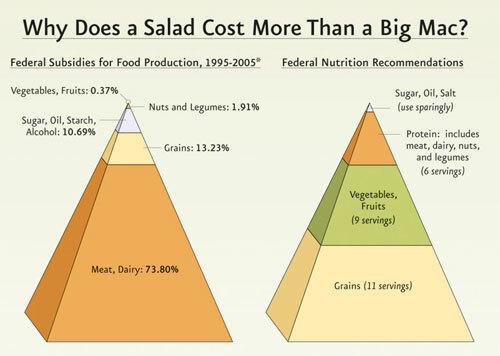 One triangle shows what the federal government subsidizes, and this is in direct opposition to the food pyramid which the government recommends we follow for a healthy life. 70% of farm subsidies go to meat and dairy, according to McWilliams, and only .37% (yes, that’s point 37) to fruits and vegetables combined. No wonder so many of my students perceive a healthy diet as an expensive and elite one. I plan to read McWilliams’s book Just Food because he seems to take no sides and instead critically questions all of the sustainable food movement’s “dogma.”  He tells Portlanders local and organic is not necessarily best, and he tells ranchers that Americans should cut meat out of their diet. I found the critical inquiry refreshing and surprisingly less confusing than some of the other food writing out there because he’s not rushing to a conclusion but reveling in the complexities, asking us to hold two (or more) competing ideas in our minds at once. He’s the geeky gadfly unsettling writers like Michael Pollan and Barbara Kingsolver. I just found his food blog at The Atlantic online. If you’ve read any of his work or heard him speak, I’d like to hear what you think.